I've finished doing reviews of all the dolls I have at the moment, so I'm going to do some photo stories in the meantime. I have been entertaining myself with taking photos of them in various situations, and this set I like quite a lot. 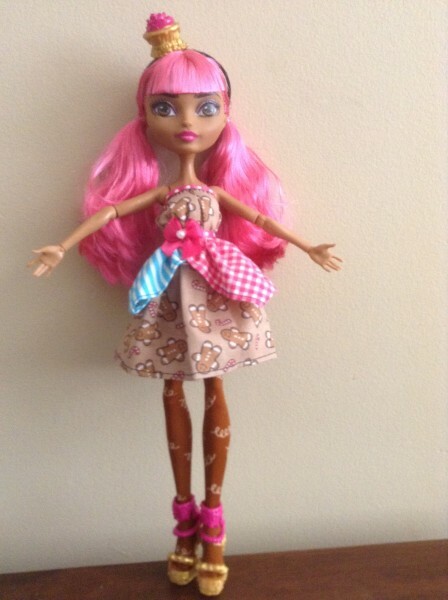 I got Ginger's dress from Etsy, I saw it when looking for / at custom dolls, and just fell in love with it. I much prefer it to her stock dress, and I can see her never going back that. While Ginger liked her dress very much usually, she had seen the new dresses the other girls had been wearing, and wanted one of her own. Her mother, the Candy Witch. had sniffed at this request, and Ginger didn't know what to do. Lizzie Hearts (who was a lovely person under all the shouting "OFF WITH THEIR HEADS!" whenever someone spoke to her), saw her moping in the Castleteria, and asked if there was anything she could do. 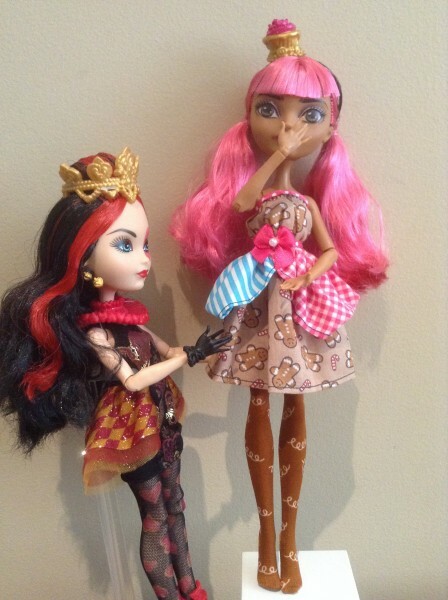 Ginger brightened at this, she had seen the lovely work Lizzie had done on the Spring Unsprung dresses, and thought that she could have something similar. Lizzie laughed, not unkindly. "Oh no, Ginger. Black and white and red are so not your colours. I'm sure I can magic up just the dress for you, I have plenty of ideas left over that I didn't use for the Spring dresses, and I know just which one to use for you!" And she refused to elaborate any further, just saying that Ginger would have to wait and see. A week later, Lizzie was putting the finishing touches on the dress she had designed for Ginger. 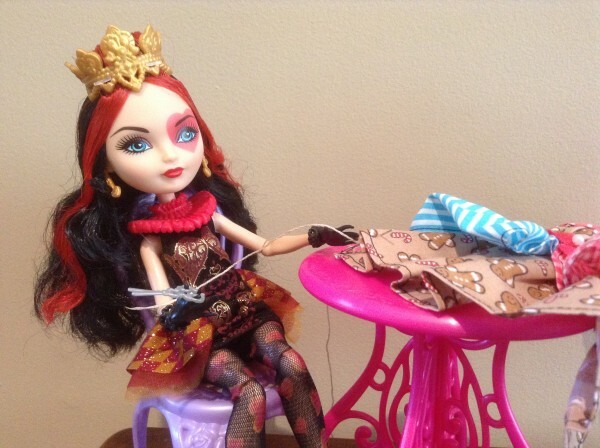 It was much simpler than the Spring Unsprung dresses she had designed, but she enjoyed doing the simpler design, as it meant she could be more creative with fabric choices. Ginger was very excited to see what fabulousness Lizzie had designed, as Lizzie had not told her anything at all about it, apart from the colours (brown, pink, and blue), and that it fit her fairytale theme of candy. She could barely sit still waiting for the final part to be done. It fit perfectly! The gingerbread men print was just delightful, and the flower on the waist was the pretty touch that was missing on her other dress. 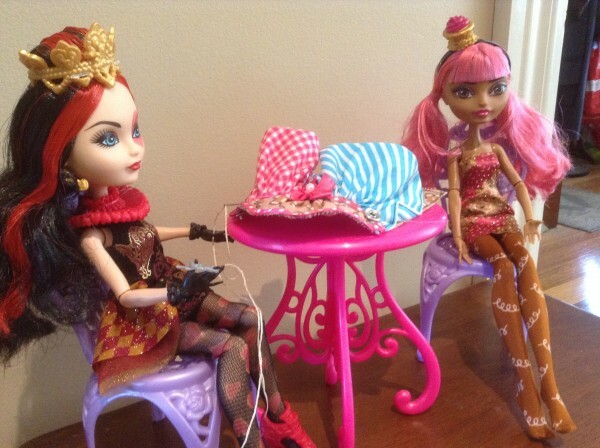 Ginger almost cried with happiness at Lizzie's generosity & talent making her new dress. Ginger didn't think there was anything she could do to repay Lizzie. Ginger looks so pretty in her new dress, she was so pleased with all the work that Lizzie did. That's so cute! And the dolls are posed just right.